The Stop Mass Incarceration Network calls on everyone to support and be part of the annual October 22 protests against police brutality, repression, and the criminalization of a generation. In the face of an intolerable situation in which police murder unarmed youth of color yet continue to go free... in which millions more continue to be sent off to prison, and in this way disproportionately affects the Black, Latino, Native American and other oppressed communities... and in which increasing repression in all aspects of life has been intensified by the Obama regime, with both Trump AND Clinton promising worse... this resistance must grow to include ALL segments of society, and it MUST BE STOPPED! 11:30 a.m.: Meet at Fruitvale (BART) Station Plaza (on the International Blvd. side), for car caravan thru East Oakland, and then at 3:30 p.m. go to Rally for the 50th Anniversary of the Black Panther Party, at 3:30 at Oscar Grant (City Hall) Plaza, at 14th and Broadway, downtown Oakland. 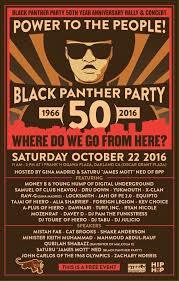 REVOLUTION BOOKS has a booth at the # BPP50 event at Oscar Grant Plaza starting at 11 am so come by!